"What do you do?" a question that I've ask myself before many times....but this time it came from my 5 year old daughter who was hovering next to me while I was sitting at my drafting table. "Ahhh well I print, and write, and I also teach other people how to make art." Her eyes lit up, a plan was forming. "So you teach just like my teacher at school?" I nodded "Well sort of, but in a studio not a classroom." She grinned "Then when are youuuuu going to teach in my class?" In truth I had been thinking it would be fun to do something in her class a bring you dad to school type of thing but as of yet the opportunity had not come up. "Well I guess I could talk with your teacher..." Before I could finish she shouted "Cooooool!" and was off. I guess I was on the hook to visit her class. As it turned out her school was just about to hold its annual fund raiser "The Big Chili" and each class traditionally has donated an item to be auctioned. Here was my chance. 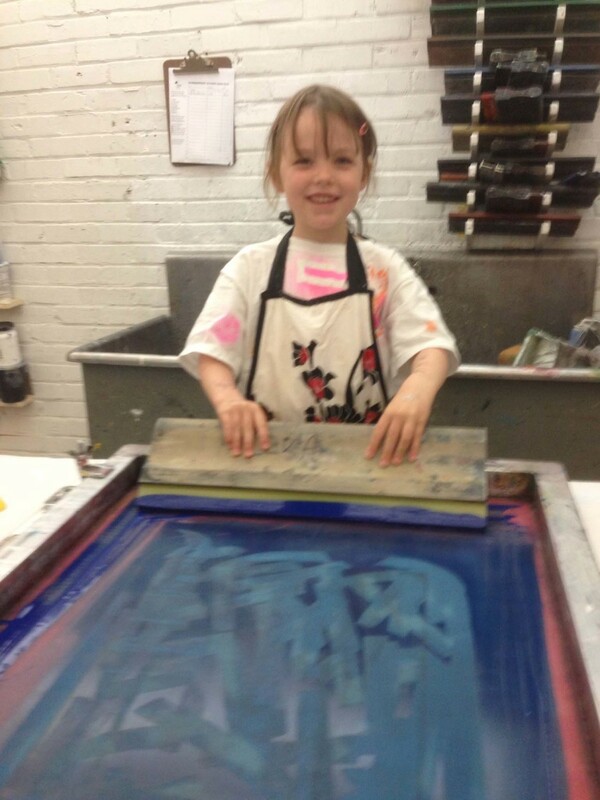 I would go to her class and give a screen printing demo and then have the kids create a print. I told Maxine and she was quite pleased. Every morning for the next three weeks she asked when I was teaching her class. Now the trick- What to print for the demo? Maxine immediately offered up the general theme of 'princess' and though I have nothing against princesses I figured that some of the boys in the class might take issue. Maxine and I compromised on a dinosaur the only stipulation being that it had to have a flower. As for the print that the kids would make for the auction I teamed up with another parent who has experience teaching kindergarten. She came up with the idea of having the kids each make a letter from the alphabet. I thought this was a great idea as it would create a cool eclectic print and cover what they are learning in school. I needed to take their drawings and copy them, by hand, on to transparent film. Theses films would then be used to create the stencils that I would use to make the prints. Printing was done at Pyramid Atlantic Art Center, an amazing resource for artists and students alike, where my daughter was able to print along with me. She had a great time although she learned a good lesson about printmaking: 75 percent of the time you are cleaning up. We printed an edition of five and one artist proof. Stoddert Elementary's mascot is a wolf so we decided on calling the print "Stoddert Howl". I dropped by her class with the finished print and the kids spent some time pointing out their letters and then I handed it over to be auctioned. I was not able to attend but after a fierce bidding war the print sold for $450. It was a great experience I would love to do it again hopefully getting more of the kids involved in the printing process itself.